At long last I am finally done with this novel. Last two years I read the first part of the trilogy which I thoroughly enjoyed, please click here. In Palace of desire, the family saga continues. Al-Sayyid Ahmad is done mourning the death of one of his sons who died in the first sequel, he went back to his life of alcohol and women, though he realised he has aged. He decides to keep a young mistress. girl who ended up marring someone else, an event that chatters his heart, he tries to find consolation in one of the brothels down town, he was surprised. Yasin, the oldest son, who constantly gets married and ends up divorce, his father is totally against his last marriage, however, he couldn't care less. There is not much to tell about Al-Sayyid Ahmad's daughters, since they were married off. His wife is pretty much silent in this sequel. 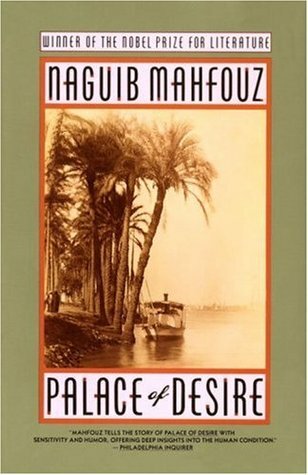 Palace of Desire is a well written novel, rich in culture and colour, it won the Nobel Prize for literature. However, I must say it dragged me along. I am just one of those people who tries to finish what they have started. I think I will even end up reading the third sequel.